Pam Baker of Magdalene Jewels featured me in a post!! Pam is featuring me mainly to help promote the Design Style Guide Giveaway #5.Â In part Pam writes “Diane views her artwork as something to uplift and inspire other people For those familiar with her work know that her vision is to portray her artwork through her use of many vibrant colors.”Â She also kindly featured me another time with a long detailed, lovely post on her blog.Â Here is that post – called “An Artist with a Vision!”Â Pam is such an incredible supporter … but make sure you get your entry in too to give you a chance of winning my FREE art at DSG Giveaway #5!! (http://designstyleguide.blogspot.com/2009/10/giveaway-5-featuring-diane-clancy.html)Â Thank you, Pam! The Design Style Guide is a wonderful place that is bringing together thousands of items that are appropriate for Home Decor. Their main purpose is to promote the team and its members to Interior Designers (and like-minded consumers) through various promotions and advertising techniques. This is part of the move to promote handmade items instead of mass produced things. Their focus is on marketing and branding â€œHandmade Home Decorâ€ to professional Interior Designers. They are having a series of giveaways – the current one with Diane Clancy (yes, ME!!) at Etsy, 1000 Markets and ArtFire. This is a free giveaway and I encourage you to join in and see if you can win!! The Giveaway is through October 20 – so join in today!! 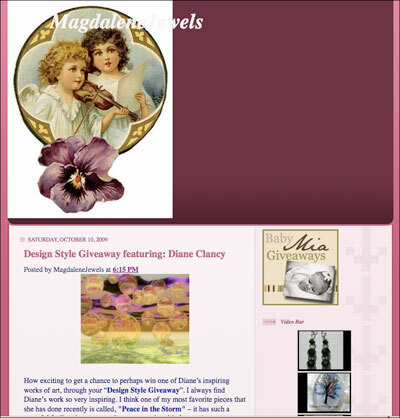 Here are the details about the giveaway on the Design Style Blog. You know my art – I encourage to go join in the giveaway. Here are my shops Diane’s Etsy shop and Diane’s 1000 Markets Shop and Diane’s ArtFire Shop. This is a great opportunity and let’s hope one of you wins!